The sad news comes of the death of Sir Charles Mackerras at the age of 84. Many obituaries and tributes are appearing and inevitably these focus on his excellence in the music of a few specific composers. But there was much more to Sir Charles than specialisation, so I am adding a few personal thoughts to the appreciations elsewhere. We live in an age that categorises people by their specialisms, which means the role of the all-rounder is accorded little value. Of course Sir Charles Mackerras excelled in the music of Leoš Janáček and others. But he was also an all-round professional who brought great music to a wide audience. In fact he was especially valued by other musicians for his lack of specialisation. My colleague at EMI the late Douglas Pudney, an authority on neglected music, talked in repertoire meetings about 'Chuck 'em up Charlie'. This was a compliment not a disparagement, and was prompted by Sir Charles' ability to learn and record obscure music without using hours of studio time. 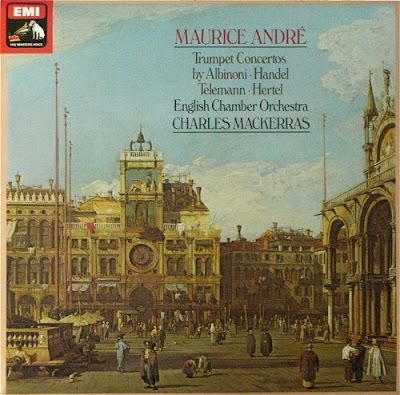 Above is one of the discs that resulted, recorded with French trumpeter Maurice André and featuring among other works Johann Hertel's (1727-1789) Concerto in E flat major. Let us remember that Sir Charles conducted three Ring cycles in 1976 while music director of English National Opera. At that time he had the unenviable task of picking up the Wagner ball whenever it was dropped, which was frequently, by the inspired but mercurial Reginald Goodall. In 1972 Goodall withdrew from a new Rhinegold production at short notice, Sir Charles cancelled all his other commitments to master the score in three weeks and delivered a performance that was praised by the critics. He went on to take the Ring on tour, no easy task, in 1974 and 1975 and during his time with ENO I heard him conduct a fine Die Meistersinger. Sir Charles' Brahms should also not be overlooked. His 1997 recordings of the symphonies for Teldec with the Scottish Chamber Orchestra, which use 'Vienna horns' in F as opposed to safer modern B-flat and F instruments, are revelatory. We are fortunate indeed that Sir Charles Mackerras left a great recorded legacy and that this includes authoritative interpretations of specific composers. But let us also celebrate the lost art of the all-rounder and remember him above all as a consummate and modest professional whose music making touched many in the recording studio, the concert hall and the opera house. In connection with the English National Opera Ring tribute should also be paid to Reginald Goodall's assistant John Barker. In 1972 Goodall withdrew from conducting a Götterdämmerung revival the day before it opened and John Barker took over. Official statements said Goodall was ill. In fact his ailments were mental exhaustion and depression rather than physical. Does anyone know what happened to John Barker? Sir Charles Mackerras will be greatly missed. He is one conductor whom I try to collect on CD as much as possible. And the perfect example, I think, of his catholicity of taste is his recording of de' Cavalieri's Rappresentatione di Anima, et di Corpo, a magnificent performance for ARCHIV PRODUCTION. It was, interestingly, the first recording of Mackerras I ever purchased back in my vinyl days. Fortunately, it has been reissued on CD. Another interesting aspect of this recording is the participation of Wolfgang von Karajan, Herbert's brother.